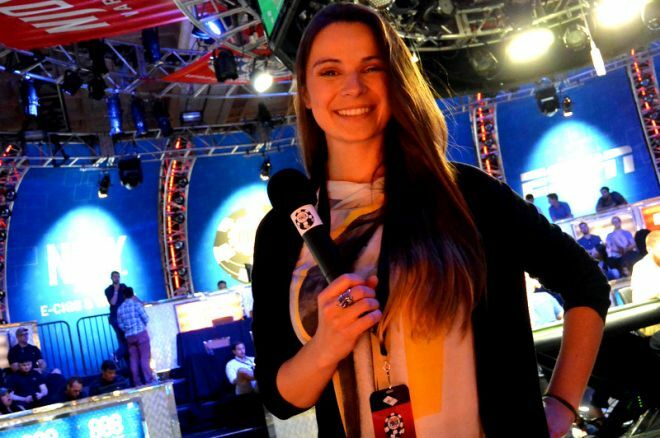 Veteran poker presenter and Croatian beauty Tatjana Pasalic talks about joining the World Series of Poker Live Stream crew at the 2015 WSOP. As if all the World Series of Poker on-the-felt action and top-notch commentary from David Tuchman featuring a bevy of high-stakes poker pros wasn't reason enough to watch the WSOP final table live streams, the folks over at WSOP.com have added a little value this summer. Helping Tuchman fill the commentary booth with big names while performing sideline and winner interviews throughout the series will be the one and only Tatjana Pasalic. A veteran presenter for outlet's including the SKY TV's poker channel in the UK, Bodog and CalvinAyre.com, the World Poker Tour's Live Reporting all across Europe, Asia and the United States, and even right here on PokerNews, the 30-year-old Croatian beauty could not be more excited to be joining the live stream team. "I was very excited when I walked in to the Rio and they gave me this badge that says I'm WSOP Media," she said. "I was like 'Oh my God, this is happening.' I remember when I first came to Las Vegas when I was 21 and I saw all these guys and girls running around doing interviews and I thought it looked so awesome. Now I'm here and it's pretty cool. The badge says all access too, so it's pretty sweet." Pasalic has been around long enough now she's truly become a part of the poker community itself, interviewing tons of players, playing in the WSOP Main Event multiple times (including slipping on a catsuit for the big dance in 2013), and becoming a fixture at tournament stops around the globe. She's seen the highs, the lows, and has grown as a media professional alongside the community itself. "I feel like we've all kind of grown together," she said. "It used to be we all couldn't wait for the Day 1s to end so we could party. Now, so many years later, people are getting married and they're getting a little more serious. Of course, there's always new kids, but I don't get them at all because I'm so old now. But seriously, I love it. With this job at the World Series it's great because I know so many people now and its not difficult to grab an interview. Five or six years ago it was like 'Oh my God, what am I going to ask him?" and I had to do so much research. Now I've seen these people win, make final tables multiple times, have crazy bustout stories and you can kind of put that all together, so its fun. I really feel like a part of the community now." Speaking of getting married, Pasalic has plans of her own to wed poker pro and long-time beau McLean Karr back in Croatia this fall. Always the picture of health and wellness, she's also been undergoing serious cycling training these days, with plans to try out for the Croatian National Team next summer. "So basically I get up at 4 a.m. and there's a man that makes me cycle until my legs shake and I'm vomiting," she laughed. Pasalic also continues to pursue her passion for the culinary arts, having appeared on several cooking shows back in Croatia. But even with all her interests outside the game, something has always kept her tied to poker. "Every time I step out and try to do something outside of this industry I just end up right back here," she said. "I feel like poker is a curse and its really over for everyone in it. Once you're here you just can't leave. Seriously though, I'm still here and I'm loving every minute of it." A sentiment live stream viewers will no doubt be sharing throughout the 2015 WSOP.